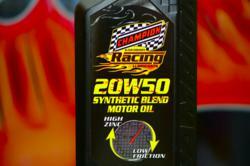 The Racing and Performance Division of Champion Oil announced today an expansion of its International export distribution program. Qualified International lubricant and chemicals distributors are encouraged to contact Champion to discuss available International opportunities for distribution. Champion, during the past few years, has developed a top-tier standard for racing and performance lubricants that suits the needs of International engine builders, race teams and performance enthusiasts. Champion Racing Oils are “Purpose-Built” for use in all competition and race engines, especially those using flat tappet or roller cams operating at high RPMs and requiring high-pressure valve springs. Champion Racing Oils contain high zinc and phosphorous formulas designed to deliver the correct balance of chemistry to protect high performance engines. These products also contain Champion’s proprietary TVS® (Thermal Viscosity Stabilizer), which extends oil film capacity for better protection at high temperatures and contain special lubricity modifiers to reduce friction and unlock the full potential of any engine. These semi and full synthetic racing oils are offered in a popular range of viscosity SAE grades and formulated to meet the demands of most of today’s high performance race engines, producing measurable increases in compression, horsepower and torque. The following list is only a sample of over 100 SKUs from the Champion Racing Division available for export.